Large Living room with Gas Fire place and large "now covered" deck in rear. Modern Kitchen fully equipped with newer appliances including gas range micro-hood, refrigerator and a dishwasher. 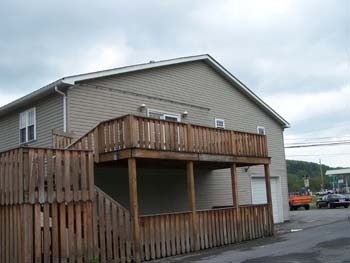 Utility / laundry room can be used as a spare or office room and is equipped with washer and dryer behind closed doors. pull down steps for additional space for storage. Call Now for details and make your appointment to see this home sized apartment! Kitchen Dinning Great room Great room fp Great Room.